Ryan Browne you will see is an exceptional comic book writer, artist and illustrator you may not know. 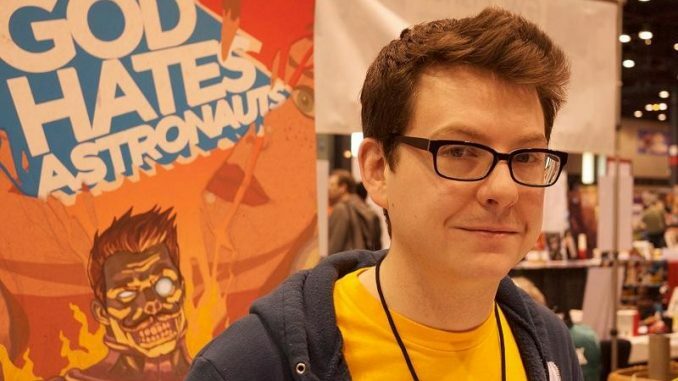 His work on God Hates Astronauts, originally a web-comic is bending the superhero genre like nothing else in this business. I had the chance to interview him online regarding his life itself and his upcoming projects. Milán Kovács (Comic Conventions): Please tell us about yourself, what did you work on previously and how did you get into comics? Ryan Browne: I attended the Rhode Island School of Design where I majored in Illustration. 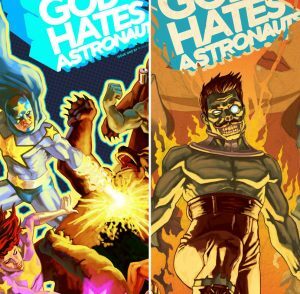 I have been working as an illustrator and designer for the last five years while working on God Hates Astronauts (GHA) on the side. My first work in comics was for Devil’s Due Publishing and I only got the job as a fill-in artist because I had a friend that was working for the company. Since then I have worked on Smoke and Mirrors for IDW and am currently working as a fill-in artist on The Manhattan Projects and will be taking over as the regular artist on Bedlam. 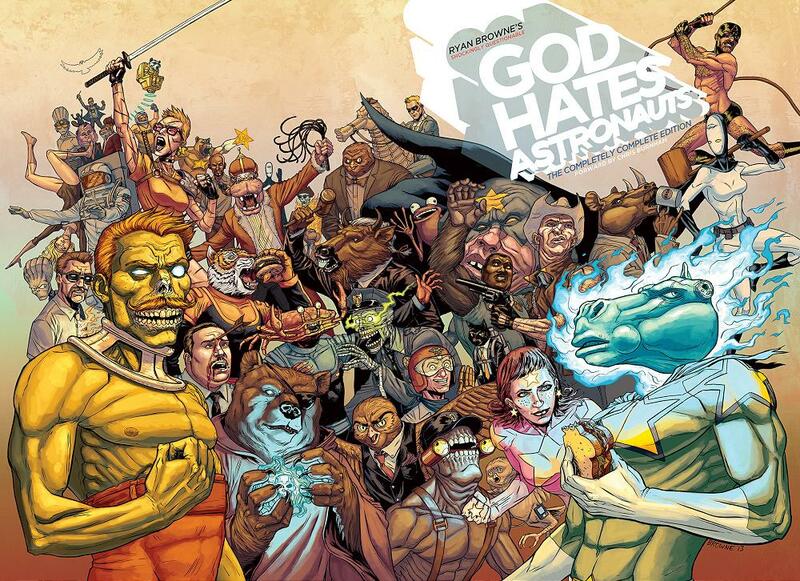 Please tell us something about God Hates Astronauts. 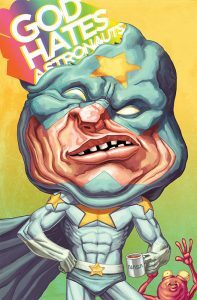 God Hates Astronauts is a book that I’ve been doing off and on for the last six years on the web. It originated as an improvised 24-hour comic that I then refined and rewrote and turned into the script for the first issue. So basically the book is not super well planned and started as a vehicle for me to tell ridiculous jokes with ridiculous characters and overly descriptive sound effects. I love humor and referential parody and in print comics that is something that doesn’t exist too much anymore so GHA found it’s home on the web. It’s strange to me that humor is so prominent in most forms of media but NOT in “comics”. They’re called COMICS for Jupiter’s sake! How did the weekly web-comic idea come? What do you think you learned during the progress? GHA became a web-comic because I was losing too much money on self-publishing and very few people were reading it. The current version of the first issue that I sell is actually the third print of the book and it only exists because the web-comic started creating a demand for print versions. Web-comics taught me a lot about getting involved in social media and how to lean on your friends (and vice-versa) to get the word out. Do you recommend up-and-coming artists to start their own webcomic? YES! It’s the best way to gain exposure and tell exactly the story you want to tell. Don’t waste your time doing pencil submissions forever, if you want to draw comics, start drawing them! GHA is a very unusual touch on so-called superheroes. What interests you in these guys and what inspired you when you first started writing and drawing them? Well most people in comics grew up drawing superheroes. As an adult, the whole concept just seems kind of silly — so for me they are an easy target for parody. Do these characters in GHA have backstories? Yes and that’s part of the fun of GHA: The Completely Complete Edition which I am funding on Kickstarter. I hired 17 amazing artists to draw two page origin stories of my character from GHA that I wrote specifically for each artist. I’ve got amazing artists such as Tradd Moore, Tim Seeley, Jenny Frison, Hilary Barta, Riley Rossmo, Nick Pitarra, Tom Scioli and many many more. It’s the best thing I’ve ever done. As far as I know you successfully used Kickstarter already for funding Blast Furnace, another experimental comic work of yours. What’s your opinion about crowdfunding? I love it but it takes a lot of trust from people and is highly stress inducing. When you start seeing the orders pile up it can be overwhelming to comprehend shipping out that many books! It’s fantastic to be able to interact directly with the fans and to get the amazing outpouring of positivity from everyone. So what exactly do people get if they pledge on your GHA Kickstarter? Are there crazy incentives like the ‘mustache-level’ in Blast Furnace where you said you’d draw every character a mustache in the whole comic book? Yeah there are a lot of fun levels. My favorite is the “Defaced Edition” where I treat your copy of the book like a men’s room wall and scribble crass things all over it. I’m excited to do that. Very excited. 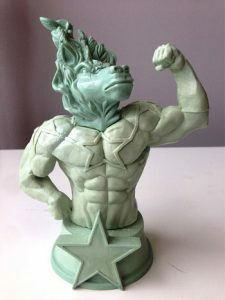 Also we have a resin statue of the main character and every backer gets a digital download of the God Hates Astronauts theme song that was written and performed by “Murder By Death”. It’s so damn awesome. In these times where not only indie and creator-owned comics rule but Kickstarter and other crowd-funding websites revolutionize comics (and so many other genres) where do you think the future of comics takes us? And not just simple comic books, there are interesting new approaches like Madefire which provides more than just viewing experience. Yeah I think things are moving in a very exciting direction. The comics industry and the music industry have many things in common in terms of how they are adjusting to using new media. Perhaps at some point we will start seeing companies with digital subscription fees for their entire catalog. I’m just excited that we are at a time that creators can have such direct contact with their fans. I sure hope that people keep up with actually fulfilling their promises as far as crowd funding is considered. I have a fear that too many people will start getting involved that don’t have the ability to actually deliver there products. I find it strange that a good artist (and writer) like you don’t already work for big publishers regularly. But there was Smoke and Mirrors at IDW which you provided art for, right? Can you tell us about the project? It was quite interesting in its concept and the fact that you included some “magic” in the back material too. Well I have a reasonably un-mainstream comics style. I am currently drawing issues of The Manhattan Projects and Bedlam for Image Comics so I am certainly moving in the right direction. I’m not entirely sure if I would enjoy drawing for Marvel or DC, but I won’t know until I do. 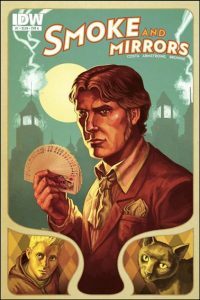 Smoke and Mirrors was a fun experiment in incorporating slight of hand magic and visual trickery within the frame work of a comic narrative. It was co-written by Jon Armstrong who is one of the premier “close-up” magicians so the tricks were all heavily researched and tested before we used them in the book. Going back to GHA, do we also get some behind the scenes material from you? I think I’m in the majority to say that I’m quite interested in them. Along the years with GHA you printed GHA-inspired pin-ups by Tim Seeley and Chris Burnham just to name a few. Do you still have some surprises for the fans of GHA in this Kickstarter? TONS OF THEM. There are a boat load of new pin-ups as well as those old ones you mentioned. Great stuff from Tom Fowler, Ryan Stegman, Rebekah Isaacs, Ethan Nicole, Andy MacDonald and a bunch of others. It’s going to be so damn cool! which got fully funded in the 24 hours.